Domesticated geese are descendants of wild geese - in Europe and North American they would mostly likely have Greylag Goose (Anser anser) ancestry, whereas the Chinese and African populations were most likely derived from the Swan Goose (Anser cygnoides) - these can easily be recognized by their prominent bill knobs. Historically, they have been kept as poultry mainly for use of their meat and down feathers, as well as being in demand for foie gras (goose liver dish) and for specialty eggs. In recent history, their popularity has increased as charming and intelligent backyards pets, efficient "lawn mowers" and natural weed control agents. 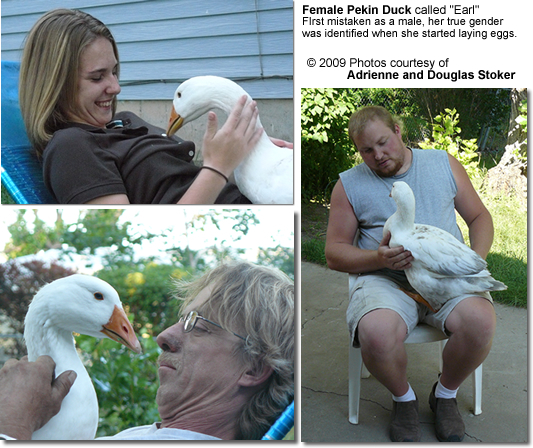 Domestic geese have short legs, short beaks and necks. They often have distinct fat pads in the abdominal areas. Depending on the breed, the feathers are curved or curly. Heavier: One goal was to increase their size (a desirable trait for table birds) - to this end, the largest specimen were continuously bred leading to larger, heavier offspring. White Plumage: White-feathered birds were preferred, as they are considered more handsome by many - but also because they look better plucked and dressed. Therefore, the domestic breeds increasingly lost the browner and darker tints of the wild geese and have more white feathers; or are even completely white. 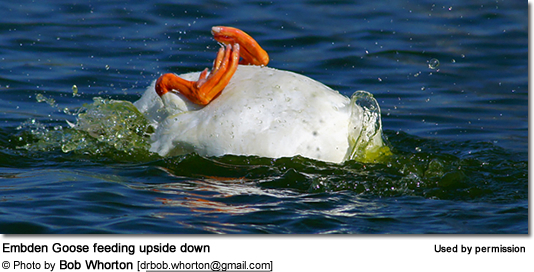 Body Posture: Domestic geese have larger back ends than their wild counterparts and stand more upright; while wild geese have slimmer back ends and maintain a horizontal body posture. Flight: Due to their large size and upright posture, domestic geese can't really fly, although when alarmed - and with a good tail wind, they can get off the ground several feet and can remain in the air for up to a quarter a mile - particularly when moving downhill. 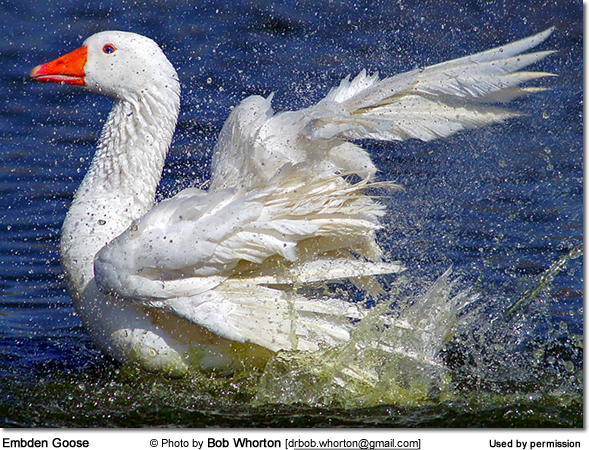 Goose breeds are generally grouped into Light, Medium and Large or Heavy weight classes. Good utility birds usually used for meat and / egg production. Embden Geese (sometimes called Giant Embden or Emden) - the most popular of the heavy breeds. 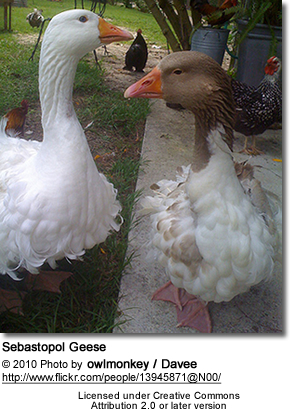 Toulouse Geese (sometimes called Giant Dewlap Toulouse) - Two types are available - exhibition birds or utility (production) birds. The utility birds gain weight rapidly and are commonly used in the production of the paté foie gras (French for fatty liver). The exhibition birds have exaggerated dewlaps and keels. Toulouse Geese are not good foragers. The medium breeds are generally easier to breed than heavyweights and - because of their smaller size - are generally more manageable. Brecon Buff Geese - originates from Wales, Great Britain. Resembles the related the American Buff Geesebut is smaller in size and has pinkish feet and beaks. 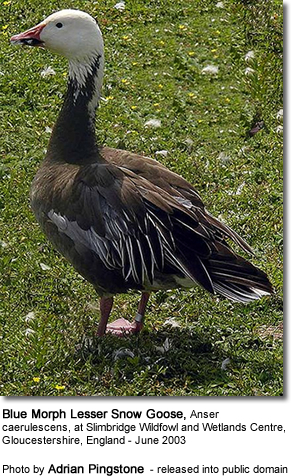 West of England Geese - Adult males are mostly white with some grey feathers; females have grey markings on the head and neck and the rest of the plumage has a saddleback grey and white pattern. Because of their light weight, they are generally not the best choices as table birds. However, their manageable size and temperament make them desirable backyard pets / birds. One advantage is that one male (gander) will mate with up to six females, whereas the large breed males will generally only service two or three females; therefore, if maximum egg production with the minimum number of males is important, light-weight geese are excellent choices. Chinese Geese (sometimes called Chinas) - Make effective "guard animals" as they will noisily sound the alarm if a potential threat is spotted. However, their loud calls can be an issue for those with neighbors nearby. They have strong legs and can wander off or swim away if not penned. These excellent foragers will also do a good job at keeping grass short and are excellent "'weeders" for different crops. are good foragers and can make great pets if hand raised. Egyptian Geese - small geese that are mostly kept as ornamental birds. When starting out, it's best to limit oneself to three (usually two females and one male, if breeding is desired). Initially they should be confined to a moveable pen with a flat, sloping roof until they are used to their new home. The pen should have at least 11 square feet (1 square meter) or floor space per bird, preferable is 22 square feet / 2 square meters per bird. The floor or the shelter should be covered with a 6-inch (15-cm) layer of floor litter (usually wood shavings) to absorb any moisture. Dirty litter needs to be removed daily and replaced. Alternatively, geese can be housed on slatted (wooden or metal) floors with narrow gaps between the slats to allow the feces to fall though. The ideal dimensions of the slats would be close to 1 inch on top (~ 2 cm) wide at the top (for comfortable standing) and about 0.5 inches (~1.5 cm) wide at the bottom. There should be about 0.5 inches (1.5 cm) spacing between the slats to permit droppings to fall through. It is necessary to remove the droppings from underneath the floor regularly. The pens should be moveable to allow you to move them to fresh pastures as necessary. As they mostly eat grasses, they can eat areas bare pretty quickly. The enclosure needs to be fully enclosed and should be locked at night to protect the geese from predators, such as foxes and dogs. Shelters out of hay bales (arranged in a u-shape), with plywood placed on top as cover to protect the geese from the elements, are also quite common. Nest boxes should be provided; however, some hens prefer nesting on the ground. The pen should have a generously sized outside area (run). Outside Space: As far as the run is concerned, the larger it is, the better. The minimum space required for an outside run would be 22 square feet (2 square meters) per bird. The fence around the run should be 3.3 - 5 feet (1 - 1.5 meters) high. 2 mm wire netting is quite suitable for this purpose. For geese that tend to wander off, a two-strand electric fence - with strands about 4 inches (10 cm) and 12 inches (30 cm) from the ground - may need to be added. The outside enclosure generally doesn't require a top over it, as domestic geese are generally too heavy to even attempt it. Before introducing the geese into their enclosures, the ground of the run should have a good ground cover of grass (millet, kikuyu, paspalum or Rhodes grass). Each breeding flock needs a separate pen and run. Geese obviously LOVE water and always should have access to bathing water. They should be provided with one or more water containers or have a shallow ditch for both drinking and swimming. Swimming is enjoyable and healthy for them. Ideally, they should have access to a pond - but large water containers are an acceptable alternative. These do require a fair amount of upkeep though, as they have to be emptied, scrubbed and refilled on a daily basis. Geese are generally easily driven into their enclosures. If handling is necessary, one should avoid holding them by their legs, the result of which could be broken or disjointed limbs. It is best to grasp them firmly around the neck and hold them close to the body. Lift up gently, grasping the legs with one hand and pinning the wings closely between arm and body. They mostly feed on grasses, leaves, weed and grain. Shredding greens and floating them in water provides a fun foraging activity for these birds. Some commercial mixes are available; but - in general - natural foods are better choices than anything that has been processed and is likely to be loaded with harmful additives. Geese that are appropriately cared for can be expected to live 20 to 25 years.